Today we move south in our recent review of European youth football tournaments with the MIC Cup. The MIC Cup, otherwise known as the MIC-Mediterranean International Cup is a youth football tournament based in La Costa Brava, a coastal region of Northern Spain. 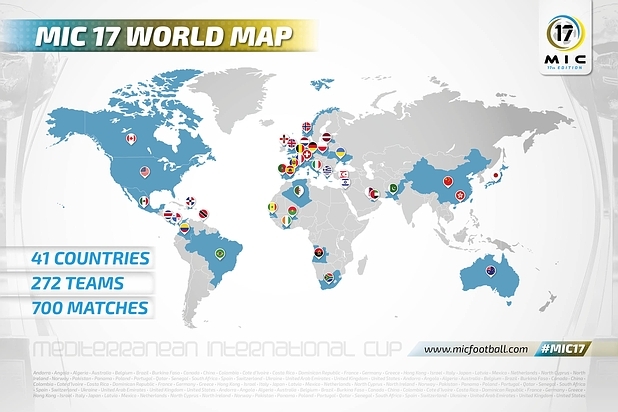 The MIC Cup calls itself the ‘number one world youth football tournament’, with a who’s who of world football having previously competed in the tournament, such as Liverpool, Real Madrid, Manchester United, Bayern Munich, Internazionale to just name a few. The MIC Cup usually takes place annually each Spring (usually March or April), and the 2018 edition will be the 18th time the MIC Cup has taken place. The rules in the MIC Cup are pretty standard and conducive to positive youth football. There will be no maximum number of players registered per team and game. All games will have two halves of 25 minutes each, with a 3 minutes rest in between. Furthermore, there will be no maximum number of players registered per team and game. Last year Villarreal, otherwise known as ‘The Yellow Submarine’ were the 1A Division winners of the MIC Cup. Previous winners include Malaga CF and Manchester United among others. The MIC Cup 2018 will see at minimum 596 matches played, with at least 5,000 competitors and around 220,000 viewers. Matches will be viewable live on TV and the internet, while 22 towns and 29 stadiums will be involved. Overall, there will be 250 teams representing 40 nationalities and five continents in this elite level youth festival of football. There will be 300 staff looking after the tournament all week, while the economic impact of the MIC Cup is an estimated €3.5 million. If you are interested in registering your team in the MIC Cup 2018 you can visit their site here, or talk to someone at our office first by clicking this link. Don’t forget to check our regularly updated blog too, which has featured lots of information on various youth football tournaments in recent weeks.